Walt Disney World is no doubt an expensive place to visit - once you've factored in the price of getting there, staying in a hotel, park tickets, food and merchandise it will more than likely be a trip that will be in the thousands of dollars in terms of cost. Once you've paid for the basics there are many more experiences that Disney offers to enhance your visit - whether it's dinner in the castle with princesses, championship golfing or spa treatments, these are all extra experiences that come at a premium price. However, there's no need to feel pressured into paying for these extra experiences - there are so many free things you can do that will enhance your trip without spending a single cent. All the items in the list are accessible to everyone - there is no cost at all as they are all located outside the theme parks. 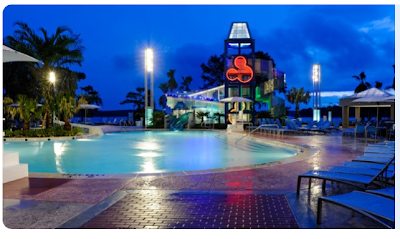 This was one idea that I initially discounted - why would you want to visit a resort? How will that add to your vacation? Trust me it will - if you love the theming in the parks then you absolutely must visit the different resort hotels. From the relaxing beach at the Polynesian resort, to the forest-feel of the Wilderness lodge to the romanticism of Port Orleans, there is something for absolutely everyone. All Star Music - one of the value resorts which still provides great theming! You don't need to be staying at the resorts to visit them and I cannot recommend this enough. 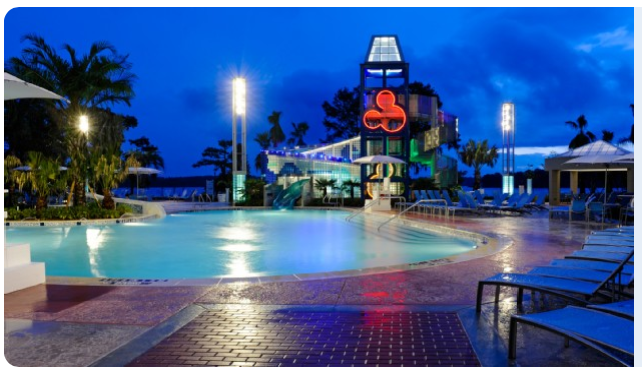 It really is possible to spend three or four days visiting and exploring the 24 on-site Disney resort hotels. Be inspired in this great seaside-themed resort boardwalk area. Although there's not a huge amount to do here that's free you can often enjoy live entertainment such as jugglers. Otherwise you can explore the attached hotel or grab a bite to eat in one of the many eating establishments. Think of it as a mini Downtown Disney area but with more character. Buses aren't the most enjoyable way of getting around but there are other ways to get between resorts of theme parks which are much more relaxing. The monorail is a great way to get a high-up view of Disney World's Magic Kingdom and EPCOT areas. The ferryboat from the TTC to the Magic Kingdom also offers some great views. The hidden gem however is the boat launches which are available between resorts and theme parks. The boat ride between EPCOT and Hollywood Studios lasts about 25 minutes as you sail past some equisit resort hotels. This is an example of some great free entertainment at Disney World. 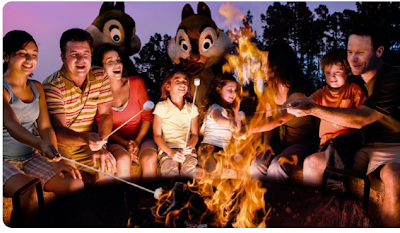 Every evening throughout the year you're able to join Chip n Dale in a sing along session around a camp fire at the Fort Wilderness Resort. There are marshmallows available for purchase to roast on the fire. The event usually runs at 8PM most of the year but you can check the current timetable here. This is also one of the only ways to get a free character meet and greet at Disney World outside the theme parks! Every evening a nighttime Electrical Water Pageant parade makes its way around the Seven Seas Lagoon in front of the Magic Kingdom. There are no characters involved and it is a very simple flotilla but it's worth seeing at least once. Plus in between the floats you can relax on the beach of any of the resort hotels around the lake! And after the parade you could stick around and enjoy the next tip on this list. 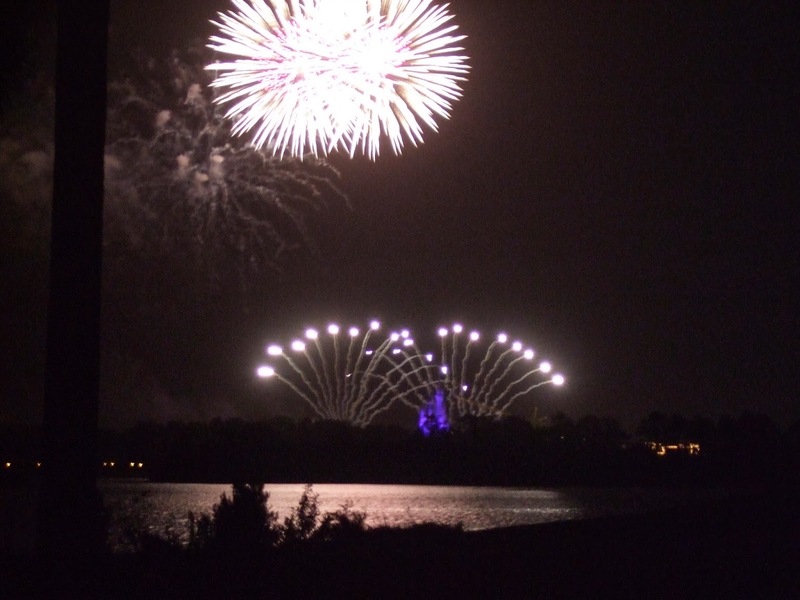 If you want one of the best views of the Magic Kingdom fireworks 'Wishes' then I've got you covered. Nothing can match standing in front of the castle and feeling the awe of seeing the nightly fireworks explode before your eyes but for a different - and I'd say equally stunning - view you need to make your way to the Polynesian beach. You should be able to see the Celebrate the Magic show from a distance at 9:45PM and then at 10PM enjoy Wishes and they even play music out of speakers when the fireworks begin (Note: times may change seasonally). We recommend you sit further back the beach as the speakers are only at the back walkway area and not on the beach itself. Sometimes you might get lucky and be able to grab a sun-lounger. If you do get there early you might be able to grab a hammock though you won't be able to hear the music from their location. If you have time I highly recommend you go and grab a 'Mickey Mousse' or 'Minnie Mousse' dessert from the hotels's quick service dining location - a lovely treat to enjoy during the fireworks! Aim to be there at least 30 minutes before the fireworks are due to begin as this is fast becoming a well-known secret. Disney World offers many tours of the parks from the Wild Africa Trek to the Keys to the Kingdom Tour. These can sometimes cost in excess of $200 per person. Disney does also run free tours of the unique aspects of some of the resort hotels - granted they are much shorter but they are an enlightening way to learn about the craftsmanship that goes into creating these settings at no cost. You do not need to be staying at the resorts to take advantage of these tours. The Animal Kingdom Villas runs the African-Inspired, Disney-Designed Tour where you can learn about the authentic theming of the resort. It lasts about 20 minutes and usually departs at 4:30pm every day from the sign outside the gift shop at the Kidani Village lobby - reservations are not accepted, simply show up on time for the tour. You can call (407) 938-3000 to confirm this tour's schedule. The Sanaa Cultural Tour explores the Sanaa restaurant in detail. It currently runs at 4:00pm daily - check in at the podium of the Sanaa restaurant. No reservations are accepted. It lasts about 20 minutes. There's no guarantees but sometimes this tour ends with a tasty treat too! You can call (407) 938-3000 to confirm this tour's schedule. The Wonders of the Wilderness Lodge Tour is something I am going to have to do when I go back as it sounds absolutely fantastic. It is a one hour tour explaining the backstory and design of the Wilderness Lodge Resort. The tour runs on Wednesdays through Saturdays at 9am - ask at the lobby concierge for the exact meeting location. Reservations are not accepted. You can call (407) 824-3200 to confirm this tour's schedule. The Culinary Tour at Animal Kingdom Lodge is a culinary tour of both the Boma and Jiko restaurants lasting about 30 minutes in length. What's more you get to sample some of the delights from these dining locations at no cost. The tour runs daily at 4pm - no reservations are requires. The tour starts from the Boma podium. You can call (407) 938-3000 to confirm this tour's schedule.